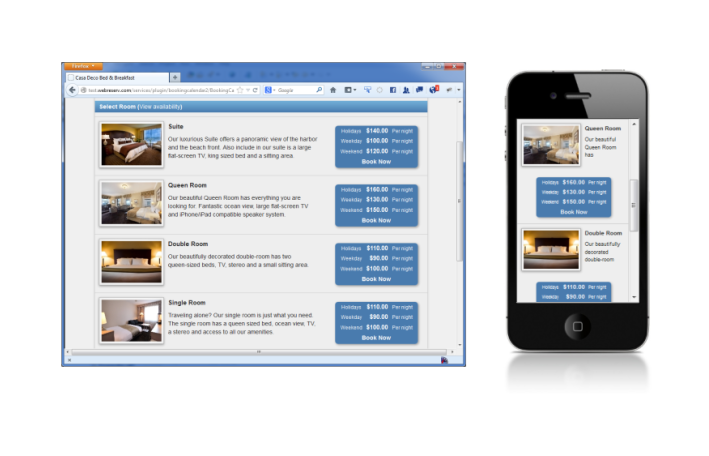 WebReserv manages the entire booking process for you. Our online booking calendar shows your product’s availability, collects the customer information, handle payments, sends auto confirmations, informs you when you receive a new booking, provides real time availability for your inventory, and gives you reports and statistics. The system provides you with an amazing tool to manage it all in a few clicks. WebReserv’s online booking system works great for tours, recreational activities, rentals, and lodgings (B&B, hotels, vacation rental, etc.). It is easy to get started. Simply create an account and add your business information, your products, pictures, descriptions, availabilities, reservation rules and prices. Then paste the calendar on your website. Everything is on the cloud, so you only need an Internet connection to access the system. Give it a try and start receiving online bookings today. Good Evening, I am in the process of researching different options for a service website. The owner of the site would like to have a calendar that shows the number of seats available for his presentation. Ideally this would be linked to the customer paying for the seat through, paypal, foursquare, or other options. Would your service be able to do this? Thank you for your time. If you have any additional question, feel free to contact me at baptiste.roge@webreserv.com. Brilliant. Is there anyway of incorporating that fix on the backend as well? – which “browser” are you referring to? The locale in my setup of webreserve was set to Australia. G’day from down under Australia. We like your system but were wondering if there was a way to format the dates according to Au style of day/month/year – instead of the current month/day/year. The WebReserv booking system automatically picks the date, time and number format based the locale selected in the browser. The custom fields I created are no longer showing as an option in the reservation report! I relied on these fields in our daily reports. There is no way to turn them back on when I edit the custom fields either. What am I missing??? There was a technical problem yesterday that affected the custom fields for certain customers. It was corrected last night at 11:30 PM Eastern. Please contact our system if you still have issues with the custom fields. I need a booking program to use where people can go to look and see if my RV is available or booked. What is your price for your service. Also I don’t have a website but need a place were potential clients can go online to see availability. Do you provide that service.